We firmly believe that You can bestow upon us the grace we implore, even though it should require a miracle. We confess we are most unworthy of Your favours, O Jesus, but this is not a reason for us to be discouraged. You are the God of Mercies and You will not refuse a contrite and humble heart. Cast upon us a look of pity, we beg of You, and your compassionate Heart will find in our miseries and weakness a pressing motive for granting our petitions. But, O Sacred Heart, whatever may be your decision with regard to our request, we will never cease to adore, love, praise, and serve You. Deign, Lord Jesus, to accept this, our act of perfect submission to the decrees of your adorable Heart, which we sincerely desire may be fulfilled in and by us and all your creatures for ever and ever. Amen. O Sacred Heart of Jesus, Your Kingdom come!" Many thanks to the Franciscan Friars of the Renewal for the gift of their music. You can pray this novena at any time but it is being recorded in 2018 especially to begin on Thursday 31 May (Feast of the Visitation & in the Vatican the Feast of Corpus Christi) and lead up to Friday 8 June, the Feast of the Sacred Heart. You can subscribe to this Novenas podcast here from the xml feed or here on itunes. To download the free mp3 Totus2us audio recordings individually, right/double click on the blue play buttons. "1. Heart of Jesus, ardent furnace of charity. During the prayer of the Angelus we desire, together with the Mother of God, to turn our hearts towards the heart of her divine Son. The invocations of these splendid litanies, which we recite or sing especially during the month of June, speak profoundly to us. May the Mother help us to better understand the mysteries of the heart of her Son. 2. "Furnace of charity". The furnace burns. Blazing, it burns any material, whether wood or another easily combustible substance. The heart of Jesus, the human heart of Jesus, burns with love, which fills it to the brim. And this is the love for the eternal Father and the love for men: for the adopted daughters and sons. A furnace, burning, goes out little by little. The heart of Jesus, on the other hand, is the inextinguishable furnace. In this it is like that "burning bush" of the book of Exodus, in which God revealed himself to Moses. The bush that burned in the fire, but ... was not "consumed" (Ex 3, 2). In fact, the love that burns in the heart of Jesus is above all the Holy Spirit, in whom God-the-Son unites Himself eternally to the Father. The heart of Jesus, the human heart of God-man, is embraced by the "living flame" of trinitarian love, which is never extinguished. 3. Heart of Jesus, ardent furnace of charity. A furnace, while it burns, illuminates the darkness of the night and warms the bodies of the frozen wayfarers. Today we desire to pray to the Mother of the eternal Word, because on the horizon of the life of each and every one of us never ceases to burn the heart of Jesus, ardent furnace of charity. Because it reveals to us the love that does not go out and never deteriorates, the love that is eternal. Because it illuminates the darkness of the earthly night and warms hearts. 4. How much the church rejoices in the fact that human hearts are kindled with love from this divine heart! How much she has joy today, that of such love was kindled the heart of Father Benedict Menni, priest, of the Hospitaller Order of Saint John of God and founder of the Congregation of the Hospitallers of the Most Sacred Heart of Jesus; and the heart of brother Pietro Friedhofen, layman, founder of the Brothers of the Mercy of Mary Help of Christians. 5. Giving thanks for the only love able to transform the world and human life, we address together with the Immaculate Virgin, at the moment of the Annunciation, the divine heart that does not cease to be "an ardent furnace of charity". Ardent: like that "bush" that Moses saw at the foot of Mount Horeb." "1. Heart of Jesus, in which are hidden all the treasures of wisdom and science. This invocation of the litanies of the Sacred Heart, taken from the Letter to the Colossians (Col 2, 3), makes us understand the necessity of going to the heart of Christ so as to enter into the fullness of God. 2. The science, of which we speak, is not the science which puffs up (cf 1 Cor 2, 2), founded on human power. It is divine wisdom, a mystery hidden for centuries in the mind of God, creator of the universe (Eph 3:,9). It is a new science, hidden from the wise and intelligent of the world, but revealed to the little ones (Mt 11, 25), rich in humility, simplicity, purity of heart. This science and this wisdom consist in knowing the mystery of the invisible God, who calls men to be participants in his divine nature and admits them into communion with Him. 3. We know these things because God Himself has deigned to reveal them to us through the Son, who is the wisdom of God (1 Cor 1, 24). All things, which are on earth and in the heavens, have been created through him and in view of him (Col 1, 16). The wisdom of Christ is greater than that of Solomon (Lk 11, 31). His riches are inscrutable (Eph 3, 8). His love surpasses all knowledge. But with faith we are able to understand, together with all the saints, the breadth, the length, the height, the depth (Eph 3, 18). Knowing Jesus, we also know God. Who sees Him, sees the Father (Jn 14, 9). With Him, the love of God is poured out into our hearts (Rom 5, 5). 4. Human science is like the water of our sources: who drinks it, returns to being thirsty. The wisdom and science of Jesus, on the contrary, open the eyes of the mind, move the heart into the depths of being and generate man to transcendent love; they liberate from the darkness of error, from the stains of sin, from the danger of death, and lead to the fullness of communion of those divine goods, which transcend the comprehension of the human mind (Dei Verbum, 6). 5. With the wisdom and science of Jesus, we are rooted and grounded in charity (Eph 3, 17). The new inner man is created, who puts God at the center of his own life and puts himself at the service of his brothers. It is the degree of perfection that reached Mary, Mother of Jesus and our Mother, unique example of a new creature, enriched with the fullness of grace and ready to realize God's will: "Behold the handmaid of the Lord, be it done to me according to the your word ". And it is for this that we invoke her "Seat of Wisdom"." "1. 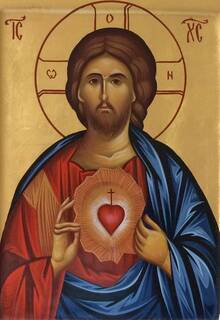 Heart of Jesus, in which the fullness of divinity dwells. Since the month of June, during the summer Sundays, our prayer of the Angelus has been drawing motives for reflection from the litanies of the Sacred Heart of Jesus. We are dwelling on the individual invocations and meditating on the great richness of content that is enclosed in them. It is a source of inspiration for our interior life: for our rapport with the mystery of Jesus Christ. 2. Yesterday, through the solemnity of the Exaltation of the Holy Cross, the whole Church once again opened to this heart in which "the fullness of divinity dwells". The mystery of Christ, God-man, has a particular eloquence when we look at the cross: here is the man! Here is the Crucified One! Here is the man totally stripped! Here is the man "broken because of our sins". Here is the man "covered with opprobrium"! And, at the same time: here is the man-God! In Him dwells all the fullness of divinity. Of the same substance as the Father! God from God. Light from light! Generated, not created. The eternal Word. One in divinity with the Father and the Holy Spirit. 3. When on Golgotha ​​the centurion with a lance pierced the Crucified One, from his side came forth blood and water. This is the sign of death. The sign of the human death of the immortal God. 4. At the foot of the cross is the Mother. The sorrowful Mother. We remember her the day after the Exaltation of the cross. When the side of Christ is pierced with the centurion's lance, the prophecy of Simeon is fulfilled in her: "A sword will pierce your own soul too" (Lk 2, 25). The words of the prophet are a preannouncement of the definitive alliance of hearts: of the Son and the Mother; of the Mother and the Son. "Heart of Jesus, in which dwells all the fullness of divinity". Heart of Mary - heart of the sorrowful Virgin - heart of the Mother of God. May our prayer at the Angelus Domini be united today with that admirable alliance of hearts!" "1. Heart of Jesus, in which the Father is well pleased. Praying thus, particularly now in the month of June, we meditate on that eternal delight that the Father has in the Son: God in God, Light in Light. Such delight also means Love: this Love to which all that exists owes its life: without it, without Love, and without the Word-Son, "nothing was made of all that exists" (Jn 1, 3) . This delight of the Father found its manifestation in the work of creation, in particular in that of man, when God "saw what he had made, and behold, it was good. . . it was very good" (Gen 1, 31). Thus is not the Heart of Jesus that "point" in which man also can rediscover full confidence in all that is created? He sees the values, he sees the order and the beauty of the world. He sees the meaning of life. 2. Heart of Jesus, in which the Father is well pleased. We go to the riverbank of the Jordan. We go to Mount Tabor. In both the events described by the evangelists the voice of the invisible God is heard, and it is the voice of the Father: "This is my beloved Son, in whom I am well pleased. Listen to him" (Mt 17, 5). The eternal delight of the Father accompanies the Son, when he was made man, when he accepted the messianic mission to be performed in the world, when he said that his food was to accomplish the will of the Father. At the end Christ accomplished this will by being obedient unto death on the cross, and then that eternal delight of the Father in the Son, which belongs to the intimate mystery of the Triune God, became part of the history of man. Indeed, the Son himself was made man, and as such he had a man's heart, with which he loved and responded to love. First of all to the love of the Father. And hence on this heart, on the Heart of Jesus, is concentrated the Father's delight. It is the salvific delight. Indeed, the Father embraces with it - in the heart of His Son - all those for whom this Son became man. All those for whom he has his heart. All those for whom he died and rose again. In the Heart of Jesus, man and the world rediscover the delight of the Father. This is the heart of our Redeemer. It is the heart of the Redeemer of the world. 3. In our prayer of the Angelus Domini let us unite ourselves to/with Mary. Let us unite ourselves to/with her, from whom the Son of God took a human heart. Let us pray that she will lead us closer to it. Let us pray that, in the heart of the Son, she may bring the delight of the Father, the love of the Father, the Mercy of God, closer to man and to the world." "1. Heart of Jesus, of whose fullness we have all received. Gathered to recite the Angelus, we join Mary at the moment of the annunciation, when the Word was made flesh and came to dwell under her heart: the heart of the Mother. We thus join the heart of the Mother, who from the moment of conception knows better the human heart of her divine Son: "Of his fullness we have all received and grace upon grace", writes the evangelist John (1, 16). 2. What determines the fullness of the heart? When can we say that the heart is full? What is the heart of Jesus full of? It is full of love. Love decides this fullness of the heart of the Son of God, whom we address today in prayer. It is a heart full of love of the Father: full in a divine and also human way. Indeed, Jesus' heart is truly the human heart of God the Son. It is thus full of filial love: everything that He did and said on earth bears witness to this filial love. 3. At the same time the filial love of the heart of Jesus has revealed - and continually reveals to the world - the love of the Father. The Father "so loved the world that He gave his only-begotten Son" for the salvation of the world; for the salvation of man, so that he "may not perish, but may have eternal life" (Jn 3, 16). The heart of Jesus is therefore full of love for man. It is full of love for the creature. Full of love for the world. How full it is! This fullness never runs out. When humanity draws on the material resources of the earth, of water, of air, these resources diminish and little by little run out. Much is spoken on this theme about the accelerated use of these resources that is being carried out in our day. From this derive warnings such as: "Do not use beyond measure". Something totally other happens with love. Something totally other happens with the fullness of the heart of Jesus. It never runs out, nor will it ever run out. Of this fullness we all receive and grace upon grace. The only requirement is that the measure of our hearts be expanded, our readiness to draw from such superabundance of love." "1. Heart of Jesus, desire of the eternal hills. In the course of these Sundays, when we gather for the midday prayer, we are reciting the litanies of the Sacred Heart in particular union with the Mother of Jesus. The Sunday Angelus indeed is our prayer appointment with Mary. Together with her we remember the annunciation, which was certainly a decisive event in her life. And here, in the center of this event, we discover the heart. It is about the love of the Son of God, which from the moment of the incarnation begins to develop under the heart of the Mother together with the human heart of her Son. 2. Is this heart "desire" of the world? Looking at the world as it visibly surrounds us, we must observe with Saint John that it is subject to the concupiscence of the flesh, to the concupiscence of the eyes and to pride of life (cf 1 Jn 2, 16) and this "world" seems to be far from the desire of Jesus' heart. It does not share his desires. It remains a stranger and, at times, even hostile towards him. This is the "world", of which the Council says that it is "placed under the slavery of sin" (Gaudium et Spes, 2). And it says this in accordance with the entire revelation, with Holy Scripture and with Tradition (and even, let us say, with our human experience). 3. Simultaneously, however, the same "world" has been called into existence through the love of the Creator and through this love it is constantly maintained in existence. It concerns/ is about the world as the whole of visible and invisible creatures, and in particular "the entire human family in the context of all those realities within which it lives" (Gaudium et Spes, 2). It is the world that, precisely because of the "slavery of sin", has been subject to caducity - as St Paul teaches - and, for this reason, moans and suffers in birth pangs, waiting impatiently for the revelation of the children of God, because only on such a road can it truly be freed from the slavery of corruption, so as to participate in the freedom and glory of the children of God (cf Rom 8, 19-22). 4. This world - in spite of sin and threefold concupiscence - is addressed to love, which fills the human heart of the Son of Mary. And therefore, by uniting ourselves to her, we ask: Heart of Jesus, desire of the eternal hills, bear to human hearts, bring to our times this liberation that is in your Gospel, in your cross and resurrection: that is in your heart!" "1. Today, at the Angelus prayer, we wish, together with Mary, to reread once more the Gospel; in a certain sense we reread it completely, and immediately. In it is inscribed the heart of Jesus, patient and immensely merciful. Is it not thus the heart of him who "passed by doing good" to everyone (cf Acts 10, 38)? Of him who made the blind regain their sight, the lame walk, the dead rise again? Who announced the good news to the poor (cf Lk 7, 22)? Is it not thus the heart of Jesus, who had no place to lay his head, while the foxes have their burrows and birds their nests (cf Mt 8, 20)? Is it not thus the heart of Jesus, who defended the woman adulterer from stoning and then said to her: "Go, and from now on do not sin any more" (cf Jn 8, 3-10)? Is it not thus the heart of him who was called "friend of publicans and sinners" (cf Mt 11, 19)? 2. Let us look, together with Mary, inside this heart! Let us reread it in the entire Gospel! However, above all, let us re-read this heart at the moment of the crucifixion. When it was pierced with a lance. When the mystery written in it was revealed in its depth. The patient heart, as it is open to all the sufferings of man. The patient heart, as it itself willing to accept a suffering immeasurable with a human meter! The patient heart, as it is immensely merciful! What indeed is mercy, if not that very particular measure of love, which expresses itself in suffering? What indeed is mercy, if not that definitive measure of love, which descends into the very center of evil so as to conquer it with good? What is it, if not the love that conquers the sin of the world through suffering and death? 3. Mother, who has looked into this heart, being present under the cross! Mother, who, through the will of this heart, became Mother of us all. Who like you knows the mystery of the heart of Jesus in Bethlehem, in Nazareth, at Calvary? Who like you knows that it is patient and immensely merciful? Who like you makes unceasing testimony?" "1. "Heart of Jesus, generous to those who invoke you!" We gather today during the prayer of the Angelus, so as to remember you, O Mother of Christ, at the occurrence that took place at Cana in Galilee. This occurred at the beginning of the messianic activity. Jesus had been invited, together with you and his first disciples, to the wedding. And when the wine ran out, you, Mary, said to Jesus; Son, "they have no more wine" (Jn 2, 3). You knew his heart. You knew that it is generous to those who invoke it. With your prayer at Cana in Galilee you made sure that the heart of Jesus was revealed in its generosity. 2. This is the generous heart, as in it indeed dwells the fullness; dwells in Christ true man the fullness of the divinity; and God is Love. It is generous because it loves - and to love means to bestow, it means to give. To love means to be gift. It means to be for others, to be for everyone, to be for each one. For each one who calls. Who calls, sometimes, even without words. Who calls by the fact of laying bare all his truth and, in this truth, calls to love! The truth has the force to call love. Through the truth, all those who are "poor in spirit", who "hunger and thirst for justice", who themselves are merciful, have the force to call to love. All of them - and many others as well - have a wonderful "power" over love. All those make sure that love communicates, gives and manifests itself thus in generosity of the heart. Among all those, you, Mary, are the first. 3. Heart of Jesus, generous to those who invoke you! Through this generosity love does not run out, but grows. It grows constantly. Such is the mysterious nature of love. And such is also the mystery of the heart of Jesus, which is generous to all. It is open for everyone and for each one. It opens completely from itself. And in this generosity it does not run out. The generosity of the heart bears testimony to the fact that love is not subject to the laws of death, but to the laws of resurrection and life. It bears testimony to the fact that love grows with love. Such is its nature. 4. To this truth about love Paul VI gives testimony in our times. His human heart stopped beating here at Castel Gandolfo, eight years ago on the Feast of the Transfiguration of the Lord. His humble successor makes his own the same truth about love, which the late pontiff proclaimed by word and by life all the way to the end, invoking the divine heart. And so thinking about Pope Paul VI, today, during the Angelus prayer, we unite ourselves in a particular way to Mary, and we say: Heart of Jesus, generous to those who invoke you, welcome your servant into your eternal light." "1. "Heart of Jesus, source of life and holiness"! Source. We remember when Jesus went to the town of Samaria, called Sicar, where there was a well that dated back to the times of the patriarch Jacob. In that place he met a Samaritan woman, who came there to draw water from the well. He said to her: "Give me a drink". The woman replied: "Why do you, a Jew, ask me, a Samaritan woman, for something to drink?" And then Jesus replied: "If you knew the gift of God and who is he who says to you:" Give me a drink", you would have asked him for it and he would have given you living water". And he continued: "The water that I will give will become source of water that gushes for eternal life" (Jn 4, 5-14). Source! Source of life and holiness! 2. On another occasion, on the last day of the Feast of Tabernacles in Jerusalem, Jesus - as again the Evangelist John writes - "exclaimed aloud: "Let the one who thirsts come to me and the one who believes in me drink; as the Scripture says: rivers of living water will flow from his side"". The Evangelist adds: "This he said referring to the Spirit which believers in him would receive" (Jn 7, 37-39). 3. We all desire to approach this source of living water. We all desire to drink from the divine heart, which is source of life and holiness. In it is given to us the Holy Spirit, who is constantly given to all those who with adoration and love approach Christ, approach his heart. To approach the source means to reach the principle. There is no other place in the created world from which can flow holiness in human life outside of this heart, which has loved so much. "Rivers of living water" have flowed into so many hearts. . . and they will flow still more! The saints of every age give testimony of this. 4. We pray to you, Mother of Christ, to be our guide to the heart of your Son. We pray to you, approach us to it and teach us to live in intimacy with this heart, which is source of life and holiness."